I was worried about making these because they seemed too cliche. They contain everything you need - sweet, salty, and crunchy. It was too good to be true. Well, it's true! These are awesome!! They are easy to make, but be careful, you will be asked to make them again! Line a large cookie sheet with parchment paper or a silicone baking mat. Set aside. In a large bowl using a mixer with a paddle attachment, beat the butter, granulated sugar, and brown sugar together on medium speed until light and creamy. Add the milk and vanilla extract and mix until combined. Turn the mixer off and add the flour and salt. Mix on low speed at first, then turn the mixer up to medium speed and mix until combined. - Keep mixing until it comes together. Mix in mini chocolate chips. Roll the dough into balls, about 2 tsp; it depends how thick you want each dough filling. Sandwich balls between two pretzels and place on prepared baking sheet. Freeze for at least 20 minutes. If you are making these ahead of time, stop at this point and continue with the remaining steps on the day you are ready to serve. While the pretzel bites are chilling, melt the chocolate with the shortening for about 1 minute in microwave, stirring every 20 seconds. If it still seems too thick, add some heavy cream - I melted the chocolate using a double boiler on the stove. Remove the pretzels from the freezer, and then dip the pretzel bites halfway into the melted chocolate and place bites back on baking sheet. 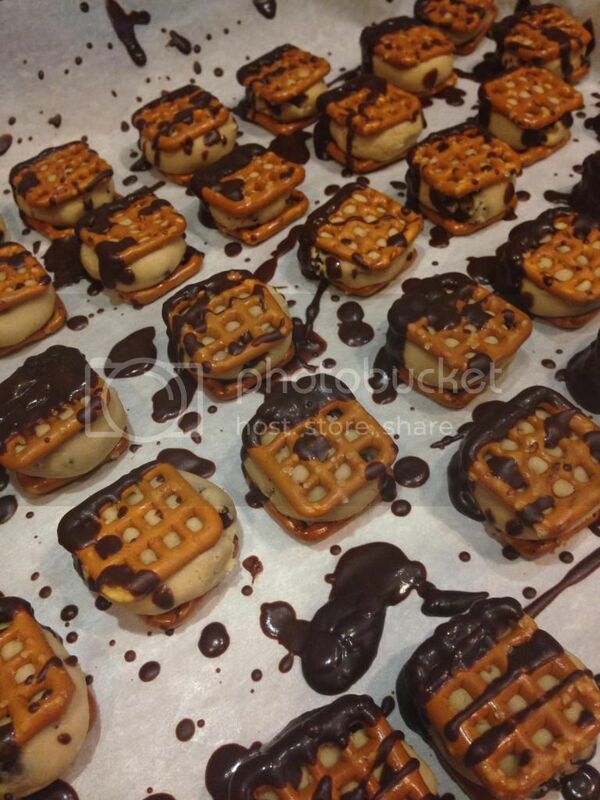 Refrigerate the dipped bites for at least 10 minutes to allow the chocolate to set. Cover and store pretzel bites in the refrigerator for up to 5 days.